hey guyz, i'm *beep* at Bill Gates 'cuz i get all the first versions of the MTM games and for some reason i don't have the patriot truck. Also, in the instruction manual( provided you still have one) for MTM2 you can see an MTM2 truck in the pinkish backround with stars like the Patriot on the side. it kinda looks like a Bigfoot repaint. please tell me why i don't have them. the bottom corner. sorry, i ment that one. it has **_* in stead of the patriot. it kinda looks like a Bigfoot repaint. please tell me why i don't have them. Why be so torn up about one fantasy truck when the game gives you 20 REAL trucks out of the box? You're probably right that it (the MTM2 example) a Bigfoot repaint, so you're hardly missing much. Anyway, the shots in the MTM2 manual are all from an in-development version of the game. Look at the tyres, the suspension. They'll always say that prerelease shots are not indicative of the final product. And anyway, they never promised you'd have a Patriot truck. And, no point being *beep* at Willy Gates. His job then was managing MS's product strategy, he wouldn't be deciding on what particular feature/truck/model/texture goes into a single game. Better target would be to complain to TRI or perhaps Microsoft Games Studio, but see points 1 and 2 above. holy *beep*! THEY CANCELED IT?!?!?!? Super easy. Go on, do it for all of us...! Well, it's probably more correct to say that at one point they were considering doing an MTM3. I believe there were negotiations with some games companies to take the project, and a concept demo was made. It didn't get any further than that though, and never became an official project. When i first saw that truck in the demo movie with the cd i went exploring all over the place to try and find it. In the Highlands Rally track the words "those who explore will be rewarded". Sp i explored alot of the track, but all i found were the football field and a crop field with alien markings on it. Looking at the truck in the sequel manual i explored a few tracks, still nothing. 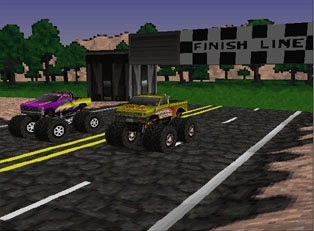 I wonder if we'll get a program to unlock Power Wheels Bigfoot and Chucks Chevy Camaro. P.S. Was The Patriot real or was it made up for the game? 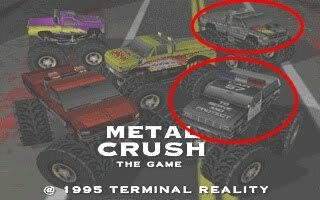 I guess the reason it was taken out of Monster Truck Madness was because it was the only fictional truck in the game, plus TRI probably wanted to round the number of trucks to an even number (12). The trucks wheels designs are those of the beta, they have more spokes and look more impressive. Unless it was a repaint there was a MTM2 Patriot truck that looked closely like the one in the packaging, it was mostly passed around on ICQ, I can't recall seeing it for download. It had the dual bars and beta wheels as well. Of course, those are included in the game, so no major feat there. I saw police bronco again the City 2000 track. Man, i would do anything for that betas! i think it's just that he's the man. i'll shoot him an e-mail to see if he has a beta. We need to get T.R.I. 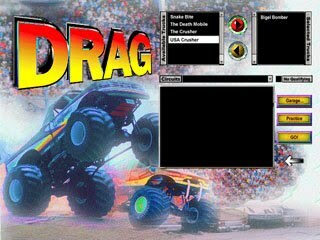 to release the beta of Monster Truck Madness. Every fan must be eager to play it. Yes, I "think" it's in the game pod.